I enjoyed my visit to your site, Assess Risk, so very much. Your pages are all wonderfully done with very interesting and informative content. I am very pleased to offer you my Friendly Site Award. Congratulations on a wonderful site. I wish you continued success with this website and all future endeavors. Colleen, Colleen's Corner. Congratulations! Your site Assess Risk has been reviewed and we are pleased to announce you have won the Bright-Byte 2001-2002 DESIGN AWARD. As You have worked hard on your site, display this award proudly, as it is a mark of your abilities and the obvious pride you take in your work. Thank you so much for your award application!! And the opportunity to visit your site. 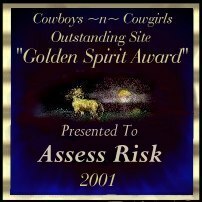 I am honored to present your site with this award, you had requested the "Spirit Award" I am sending the "Golden Spirit Award".. upon review of your site, I found no errors. And enjoyed my visit very much. Thank you again! Jen.